As careful as I tried to be during a recent painting job, I couldn’t avoid tracking white paint on our midnight blue carpet. We had the room covered in plastic, but I still tracked wet paint that fell onto the plastic to the carpet. My husband pointed it out, I hadn’t even noticed, I was busy admiring my new paint job! But when I did take notice of the spots, it drove me nuts and I had to remove them some how, and I thought for sure it would be very difficult if not impossible because the paint had dried. I went to our neighborhood Sherwin Williams store for advice and asked them if it was possible to remove dried paint from carpet. The Sherwin Williams Rep let out a big sigh …and I knew I was in trouble. I asked him if there were any products on the market he knew of that would remove the paint, and he said no. But he suggested I try hot water. 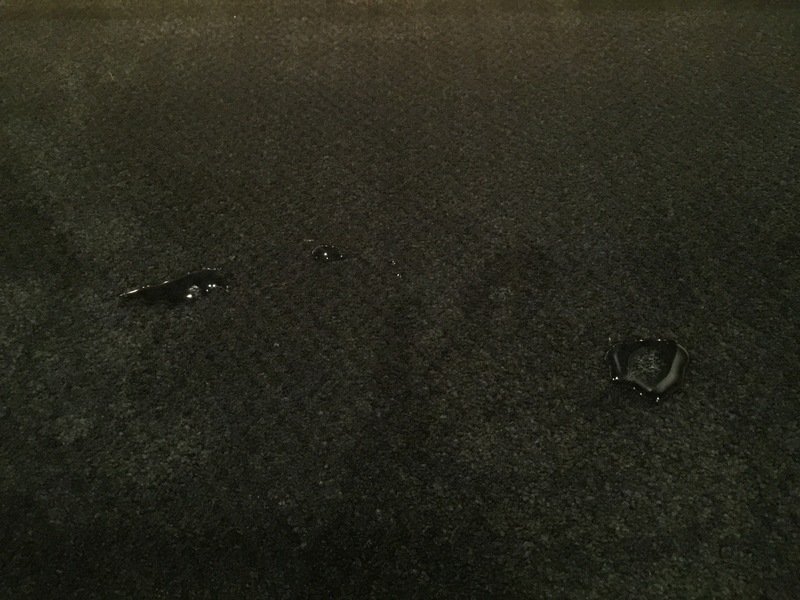 This is a picture of a couple drops of dried white paint on the carpet. I microwaved a cup of warm water for 2 minutes. I want the water extra hot so it activates the paint and makes it wet again. I poured a bit of water on the paint spots. With my nail, I rubbed the paint spot until it loosened. You can also use a bottle cap to scrape the spot until it loosens. The paint broke up into tiny pieces. Then rubbed with a dry cloth, and the spot was gone. Here is another example of a spot removal. After using hot water and rubbing it to break up the paint, it loosened really well. Poured on a bit of very hot water. The spot is gone! The hot water successfully removed all the paint spots on the carpet. I have gone back several times to check on these areas since I removed the paint, because sometimes spots you thought were gone from your carpet, seem to reappear! But I’m happy to report, no reappearing, the hot water trick worked great. The hot water trick worked so well, I was onto another paint removal trick. This one involved rubbing alcohol. In the process of having our bar cabinets spray painted, our painters sprayed the over cabinet light lenses. These lights are placed on top of cabinets to provide accent lighting, similar to under cabinet lights. Obviously having the lenses painted hinders light from shining through, so I want to remove the paint from these plastic covers. Using a full bottle of rubbing alcohol I found in our linen closet (which expired in 2013), I soaked the covers for about an hour. Using a brush, I scrubbed the covers a bit. The paint easily came off from the plastic lenses. Big difference! The rubbing alcohol worked well, and I was able to remove 80% of the paint. If I want 100% paint removal, I would go back and soak the covers a second time, but for this project, since the covers don’t show over the cabinets, I’m happy with what I removed. Thanks for stopping by! Remember to follow along on Instagram! See you next time.